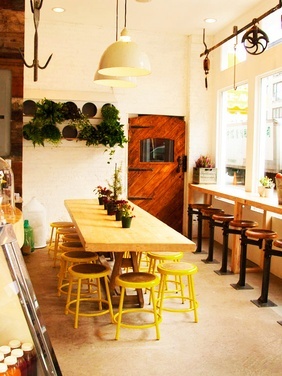 Butcher's Daughter is an impressive eatery downtown that has an earthy, cafe feel. Contrary to what the name may invoke, this spot is anything but a meat market. Plants cover the counter, hang from the ceiling and line the walls. It's a great spot to meet up with a friend for some casual, healthy bites and a fun catch-up. The standout dish is the Smashed Avocado Toast Benedict. The ham of a traditional benedict is swapped out for an avocado spread-- a mixture of lime, lemon, curry, mustard, cilantro, and a whole bunch of other nutritious goodness. The bread it comes on is amazing and from a vegan company called Bread Alone. 8am-11am M-F, All Day Sat. & Sun. 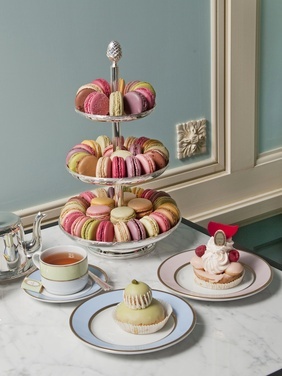 At Laduree you'll step into an elegant world, one made of fine furniture, rich, deep colors, a white marble counter, statues at the entrance, and an overall luxurious French feel. Note: the hipster crowd might feel a bit out of place. Come this spring and summer, the gigantic garden will be open, and it's also a great option for a baby/bridal shower. While exquisite, the benedict is small is comes sans ham. Instead get the rich, decadent Vol au Vent, chicken breast pieces in a creamy mushroom sauce. A gentlemanly waiter will subtly approach your table and pour the sauce over a pastry filled with mushroom tapenade. It's worth the ordering just to see the presentation. Don't forget, Laduree Tea Salon is an expansion of the Laduree Macaroon empire, so don't leave without getting a few of those too. Every color and flavor of the rainbow is offered. There's an abundance of teas on the menu, 23 to be exact. Pinky's Up!